﻿﻿﻿﻿﻿Armed with passion and tennis shoes, Geraldine Watson helped preserve the Big Thicket. ﻿﻿﻿﻿﻿﻿I first met Geraldine Watson while shooting a story about the decline of the hardwood bottomlands in East Texas. I was a young photojournalist, unaware of the volatile history between environmentalists and the local timber companies, but I’d heard about Watson’s conservation efforts and wanted to hear her story. Watson is a legendary East Texas botanist. She’s one of the folks instrumental in the creation of the Big Thicket National Preserve and the author of Big Thicket Plant Ecology, the bible of East Texas botany. Among plant people, she’s a rock star. Watson, now in her mid-80s, was born in the days when the forests were still virgin, before the lumber companies came. On Sunday afternoons, she and her mother would go walking in the woods, picking birdfoot violets and winecups. Her mom would point out plants and explain their uses — some provided fiber to make cloth, others could be used for dyes or medicines. Watson’s father, who worked at a lumber mill, would take her up and down the streams, through the woods and across the wildflower meadows. She learned each species of tree, each phylum of flora. At a very young age, she was taught to appreciate the natural world surrounding her. As Watson grew older, her fascination with flora grew deeper. She would disappear into the Big Thicket for days at a time, cataloging rare plants, collecting samples and learning the intimate details of each species. Though she would be the last to acknowledge it, Watson would come to know as much about the ecology of the Big Thicket as any living human. Over the years, Watson had become camera-shy. A few weeks before my visit, she had declined my invitation to be interviewed on camera. But on the day I came to videotape a group of biologists, she arrived with her son David. The two sat in a corner of the cavernous room where my video gear was set up. I got ready to test my audio and speak into the microphone. I don’t like the standard “testing, testing, one, two, three,” so I always recite Invictus by William Ernest Henley. I memorized it in third grade, and the poem is still in my brain after all these years. Invictus is famous for its empowering message of self-mastery, a metaphysical journey meshing one’s mind, body and spirit into a higher enlightenment of being. I put on my headphones and began my microphone check. Watson’s head came up and her eyes turned my way. She rose out of her chair and walked in my direction. The decline of the Big Thicket started while Watson was still a child. Huge old-growth forests were clear-cut to fuel the fires of progress. This fueled the fire of Watson’s activism. By the 1960s, 90 percent of the virgin forests in the Big Thicket were already gone. That’s about the time the Big Thicket Association was formed; Watson was a founding member. One of Watson’s biggest contributions to the effort was her work defining the treasure the volunteers sought to preserve. “How are we going to save the world if we don’t understand what makes it what it is?” she wonders. Those little old ladies in tennis shoes turned out to be a formidable group. 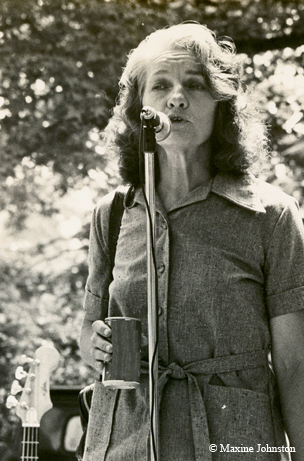 Maxine Johnston was a member. Still, it took a decade of contentious negotiation with the powerful timber and oil companies for Congress to create the national preserve in 1974. I continued speaking, adjusting my audio levels. “In the fell clutch of circumstance, I have not winced nor cried aloud. Watson now stood next to me. Her small stature belied her intimidating presence. To my surprise, Watson began to recite the poem along with me. The two of us spoke in a synchronized duet. She emoted a passion I have never felt. I forgot about the microphone check. Many people were dead set against the idea of a Big Thicket National Preserve. Sides were drawn, pitting neighbor against neighbor. Advertisements in newspapers claimed the government would take people’s homes, landowners would lose their oil royalties and hunting and fishing in the region would cease. Watson and her five children faced harassment and rejection in their East Texas community in the decade before the Big Thicket National Preserve was finally established. Ten years can seem like an eternity when you are living a life in conflict. Once the national preserve finally opened, the storm surrounding her family began to lift. But the emotional damage had been done, and her family had the scars to prove it. Bitter feelings and regrets ensued. Together we finished the last two lines of the poem. “It matters not how strait the gate, how charged with punishments the scroll. She was radiant. She was happy. She was legendary. The entire incident lasted only a moment, but has stayed with me for almost two decades now. As in Invictus, Watson’s head was bloodied but unbowed. A few years ago she made a choice to end her activism and decided to spend her remaining years on a small tract of land outside the town of Warren. Watson’s still trying to save the world — only now she’s limited her efforts to these 10 acres, which she calls the Watson Rare Native Plant Pre­serve, named in memory of her late husband. Here on her property, Watson is not alone. She has found peace and purpose, at one with her land and her higher power. What she’s done here at her preserve is remarkable, providing tangible proof that land can be restored and ecosystems can be revived. Season by season, Watson has transformed her property into a botanical showplace. She has continued her mission of “preserving empirical evidence of the creative genius of God” in her own backyard. If we truly are products of our memories and experiences, I am so much richer because of Geraldine Watson. And before every video shoot, as I do my microphone check and recite Invictus, I think very fondly of that little old lady in tennis shoes.